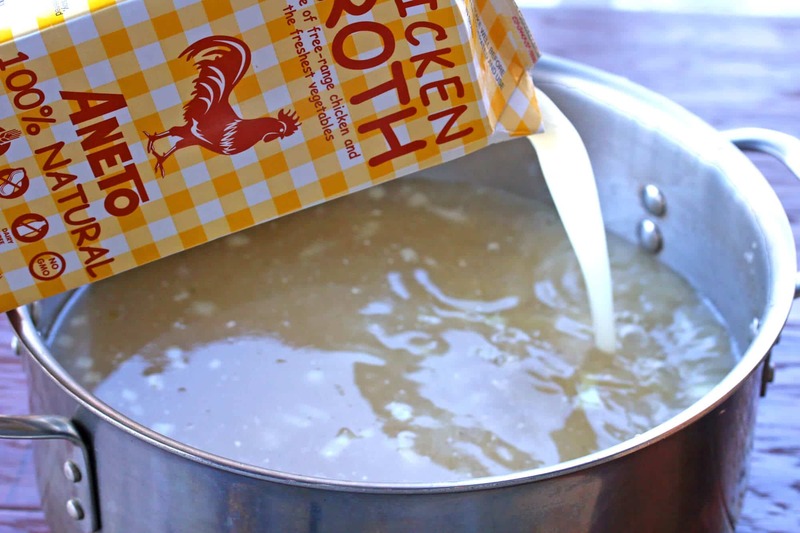 I’ve partnered with Aneto, my favorite broth manufacturer, to bring you this post. I don’t think I could live without soup. There are just those days when what I crave most is a bowl of hot soup, whether it’s the thick creamy kind or the rich brothy variety. The other thing I love about soup is its versatility; it’s such a great medium for creativity. The flavor and ingredient combinations are endless as the myriad of “1001 Soups” type of cookbooks on the market attest. Quite simply, soup is one of God’s great gifts to mankind. 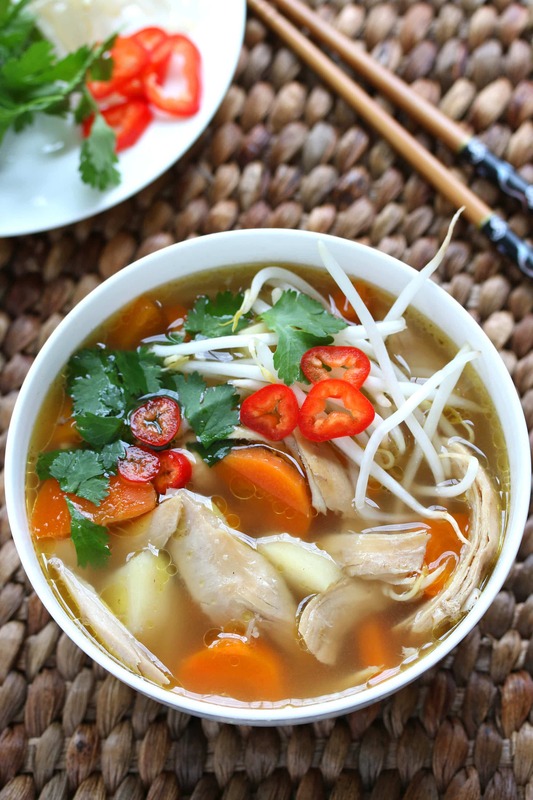 The flavor and ingredient profile of this soup is a blend of several Asian cuisines including a dash of Chinese, Indonesian and Thai. The end result is a wonderfully tummy-warming and soul-comforting soup that will transport you to another place, somewhere, far across the ocean on an eastward wind. The spices are the crowning feature of this Asian-Spiced Chicken & Vegetable Soup. I’ve mentioned this many times in previous posts but I’ll mention it again: Nothing compares to the flavor of freshly toasted and ground spices. Pre-ground spices can’t hold a candle to it. The latter have been sitting in jars or bags for who knows how long, and once spices are ground their precious, delicate oils – where all the flavor lies – oxidize and deteriorate very quickly. That’s why whole spices have a vastly superior flavor and using them – grinding your own spices – will transform your cooking. I promise. This soup brings together a wonderfully fragrant palette of spices that add depth, mystery and flavor to this otherwise simple dish. Star Anise, Fennel Seed, Whole Cinnamon, Coriander Seed, Green Cardamom, Cumin Seed and Whole Cloves are the spices you’ll need. These are all spices commonly used in Asian and Indian cuisine so as long as you enjoy that kind of food, don’t worry about them going to waste. Buy them whole and grind them yourselves in a coffee/spice grinder. I promise: Buying your spices whole and grinding them yourself will be one of the best culinary choices you’ll ever make! 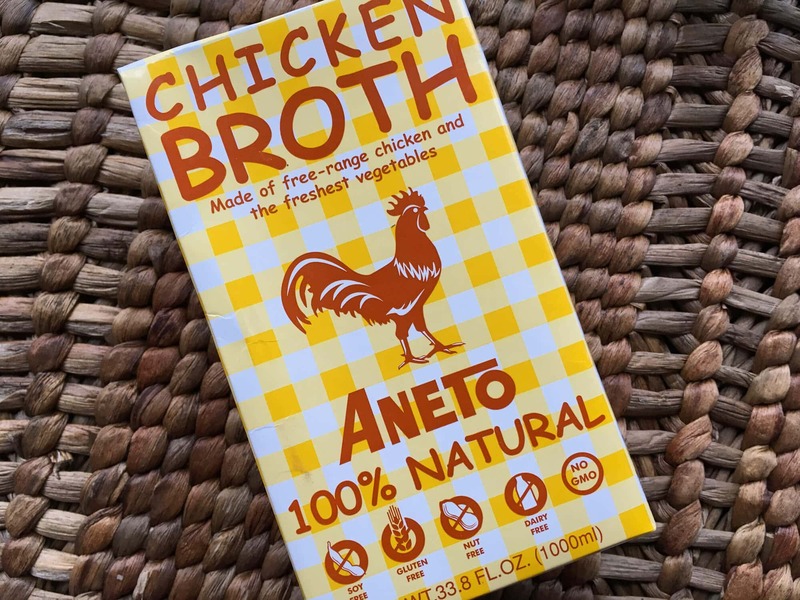 For a wonderful depth of flavor with all-natural ingredients you can trust, I’m using Aneto 100% natural chicken broth. 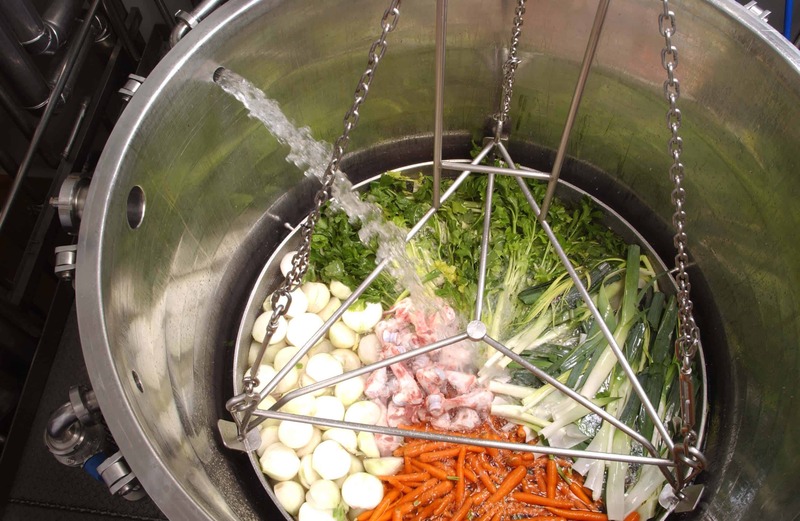 Made in Barcelona, Spain, Aneto is the world’s only broth manufacturer that makes broth the way you make it at home: Using REAL fresh vegetables, REAL whole chicken – and nothing else – and then slow-simmering it for hours for maximum flavor and nutrition. Really, you have to see it for yourself to understand what distinguishes Aneto as the most exceptional broth manufacturer in the world. Aneto products are available in stores across the United States. Click here for a store locator. 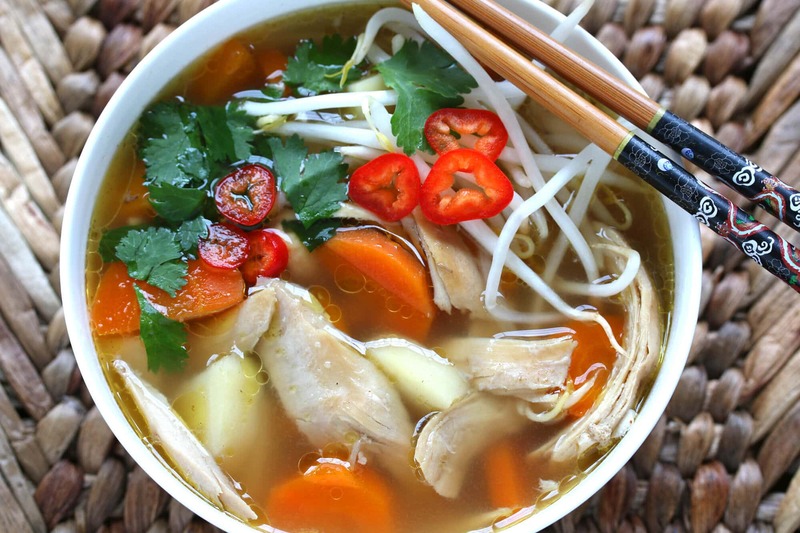 Packed with the fragrant, exotic spices of the Far East along with a pure, flavorful and nutritious broth from Aneto, and the familiar comfort ingredients of chicken and potatoes, this is a soup you’re sure to remember! Heat a small skillet and toast the whole spices until fragrant. Let cool and then grind them in a coffee/spice grinder. Add the ground spices to a food processor along with the ingredients for the Spice Paste. Pulse until ground to a coarse mixture. In a stock pot, heat about 2 tablespoons of oil in a small skillet and fry the spice paste for 2-3 minutes. …and the chicken pieces, bring to a boil, reduce the heat, cover and simmer for one hour. Remove the chicken pieces, remove the chicken from the bones and shred the chicken. Set aside. Pour the broth through a sieve, discarding the pulp from the spice paste, and return the broth to the pot. Return the shredded chicken to the pot along with the potatoes, carrots and salt. Return to a boil, reduce the heat, cover and simmer for another 25-30 minutes. Squeeze the lime juice into the soup just before serving. 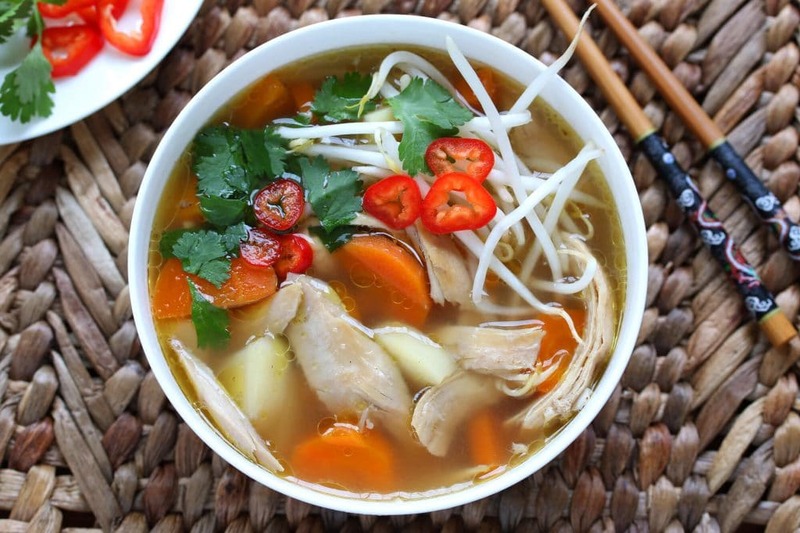 Dish the hot soup into bowls topped with some bean sprouts, cilantro and slices of red chili pepper. Bursting with layers and layers of flavor, this soup will mesmerize your taste buds! In a stock pot, heat about 2 tablespoons of oil in a small skillet and fry the spice paste for 2-3 minutes. Add the chicken broth and chicken pieces, bring to a boil, reduce the heat, cover and simmer for one hour. Remove the chicken pieces, remove the chicken from the bones and shred the chicken. Set aside. Pour the broth through a sieve, discarding the pulp from the spice paste, and return the broth to the pot. Return the shredded chicken to the pot along with the potatoes, carrots and salt. Return to a boil, reduce the heat, cover and simmer for another 25-30 minutes. Squeeze the lime juice in the soup just before serving. I’ve partnered with Aneto, my favorite broth manufacturer, to bring you this post. I feel very passionately about Aneto’s philosophy and products and consider it a privilege to share their products with my readers. 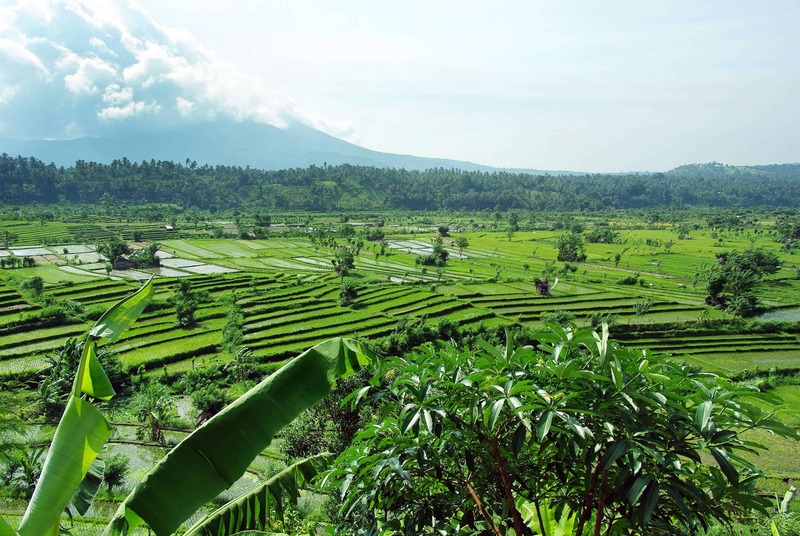 Looks so healthy and inviting! I’ll have to try! There isn’t much better than fresh ground spices! This soup looks so delicious! No comparison, Brandy, and thank you! This soup just looks and sounds SO comforting! 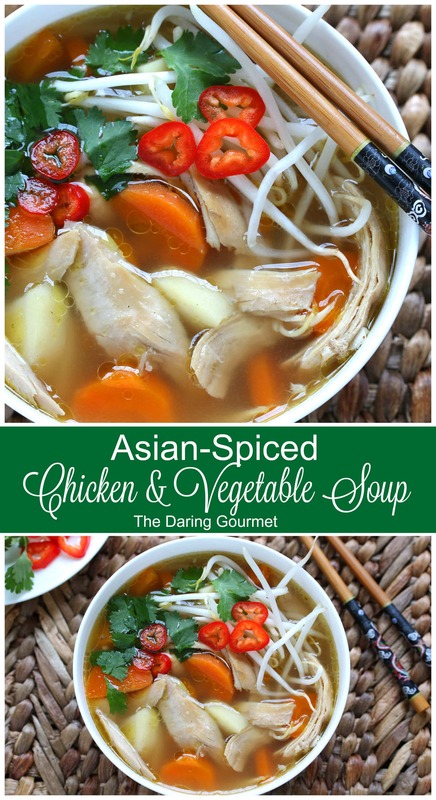 I’ve never made a chicken veggie soup with Asian spices, and I look forward to giving it a try. Thanks, Erin, it’s been a big hit around here! WOW, that looks and sounds absolutely exquisite!! The flavor must be out of this world! 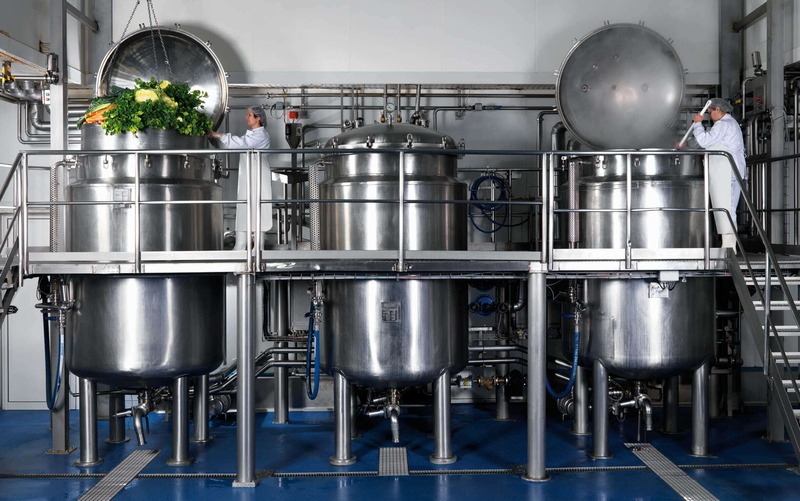 And my eyes just about popped out of my head when I saw the pictures of those ginormous stock pots at Aneto and all that fresh vegetables and chicken used to make their broth. Amazing!! I live in the Bay Area and it looks like the Spanish Table carries Aneto’s products. I’ll swing by there this weekend, I’m really looking forward to trying their broth. I also can’t wait to try this soup!! I agree, soup is the best! And with all of those Asian spices, I bet your house smelled amazing! It sure did, Amanda – nothing beats the flavor and aroma of freshly toasted and ground spices! Looks so healthy and delicious!!! Can’t wait to try it! I would LOVE a huge bowl of this for lunch. I am just imagining how amazing those spices smell and I love Aneto broth!! Thanks, Alyssa! Agreed, Aneto’s broths are THE BEST!! I need to try this broth, I am a soup fanatic! Once you’ve tried Aneto, Lauren, you’ll be hooked – simply no comparison! Thank you for all the tips, I am glad you had a good time in Barcelona. I really need to try this!! Looks amaazing!! I really LOVE the Asian flavors in this! Some of my favorite flavors ever! I agree, Cathy, I can’t get enough of these Asian flavors either! What a perfect chicken soup! I could eat soup all year long! I love that this soup is gluten free…that tour looks like it was fun. DELICIOUS!! I wanted to report back that I made this yesterday and it was amazing! The flavor was heavenly and everyone in my family loved it, thank you! 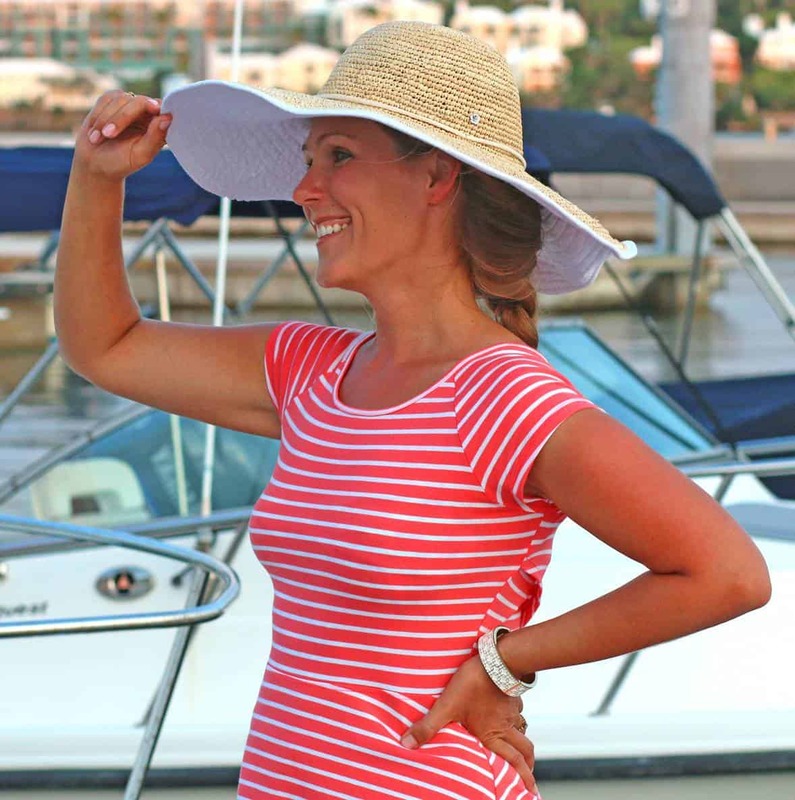 Wonderful, Cori, I’m so glad it was a hit and thank you for taking the time to report back! Wow! This looks like such a comforting bowl of soup, I have been feeling ill and I am going to have my husband make this for me now. I feel the same about soup, I make soup at least twice a week and I especially love any kind of chicken soup. This is a wonderful recipe, I would love to try. Terrific, Candace, thanks so much! Definitely be throwing some noodles in this when I make it. 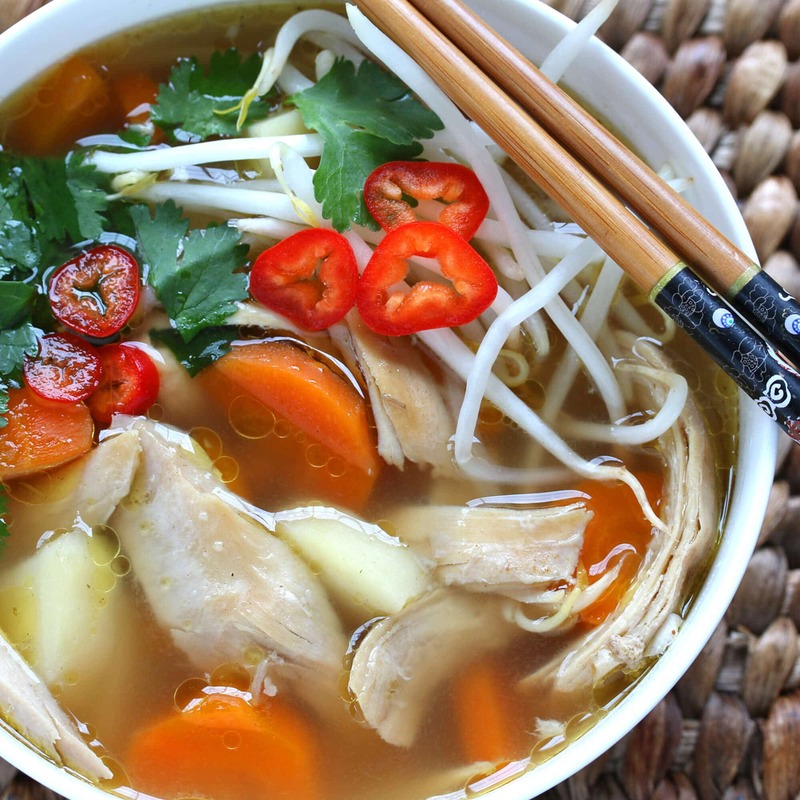 Love an Asian noodle broth! Every week, I make a large pot of soup – using broth from vegetable scraps -and will definitely try this recipe! Awesome, Edward! And what a fantastic way to make use of veggie scraps – love it!